In a world full of superficial images nowadays, it’s more critical than ever to see things for what they are really made of, not just what they look like on the surface. This is when radiography comes into the picture. Since X-rays’ discovery in 1895, radiography has developed far beyond its initially medical and industrial use to become a kind of art, eerie yet intriguing. X-ray art reveals the internal structures of the world around us, bewaring us of the true beauty invisible to the human eye. Gadgets are a part of the world around us and constitute an important part of your life if you are a geek. If you think they are lifeless, you are wrong. Radiography has blown a life into those unanimated gadgets we use everyday, bring them to our eyes under their most naked form. What can we do with x-ray sheets other than frightening kids or showing off our injuries to friends? Anastasia Spada has a better idea. 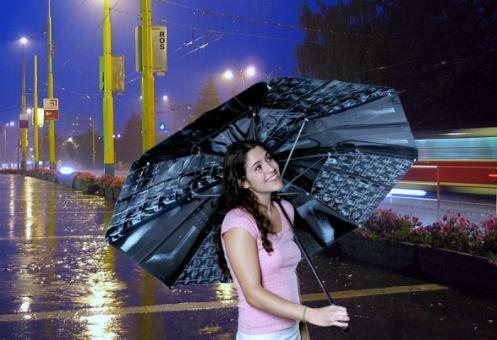 She designed a really cool umbrella from discarded X-ray sheets. The project was inspired by the magazine ReadyMade, and the idea was to create something recycling common objects from everyday life. On a deeper note, the X-ray umbrella may even denote the sustenance of health industry thanks to public health spending. 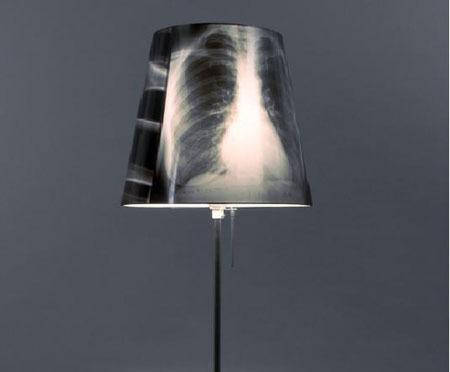 Another project to make use of recycled x-ray sheets, this stylish lamp shade was created by the Swedish graphic designer Sture Pallarp. Designs need not to be drawn or printed since the x-ray photo itself already has it. It is a norm that people tend to choose a beautiful image like natural beauty to represent their calendar. Skeleton is definitely very natural, but it’s doubtful if it’s considered beautiful. 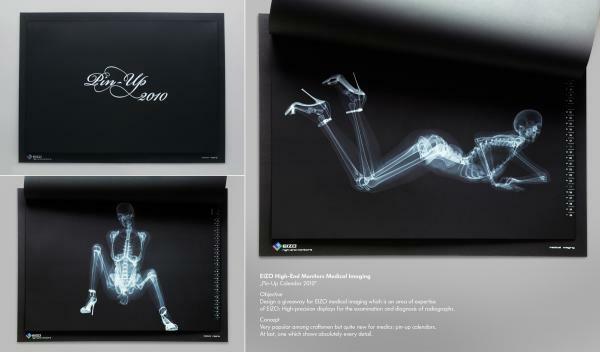 EIZO, a German company, used radiographs to make a calendar called pin-up calendar to show every detail of a human skeleton. We use light to see things, yet hardly do we consider light bulbs something to look at. 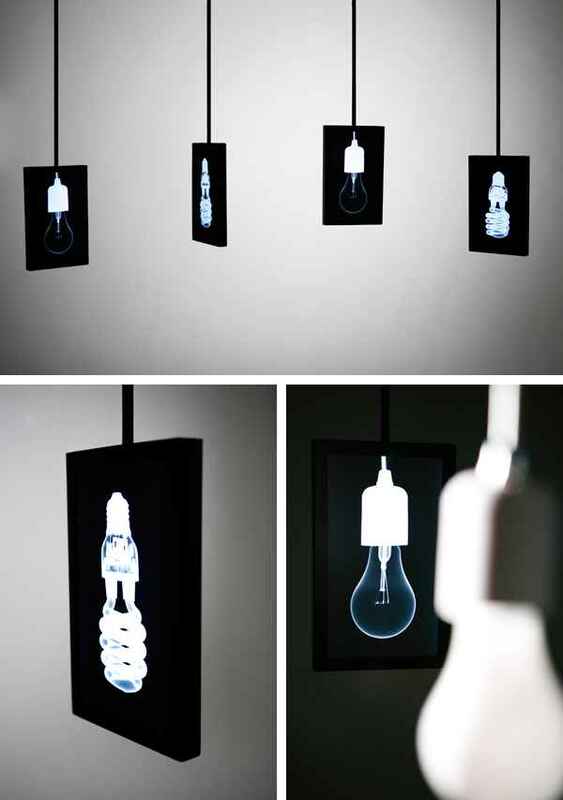 Sumulnoli has changed the paradox by bringing our old good light bulbs under radiographs to create art out of it. The new light is somewhat familiar, somewhat strange, but absolutely intriguing and beautiful, perfect for home or office decoration. 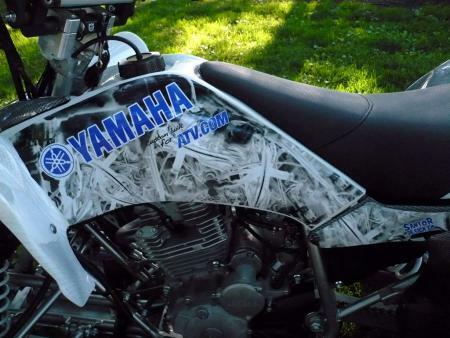 Project Yamaha Raptor 250 is a project by ATV.com that features various modified designs for your bikes. On its fifth article, it features a design from Santor Design Co. that looks to be the internals and intertwining components of an engine in an X-ray effect. Even if you love cooking, your never-changing kitchen will probably dishearten you at some point. 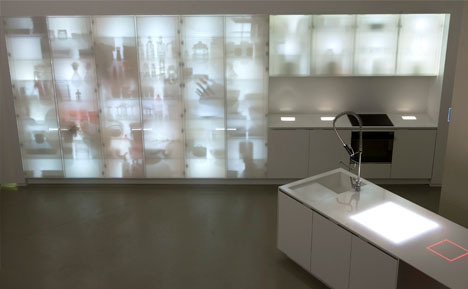 X-ray kitchen, designed by Jean Nouvel, will spice up your cooking with its unconventional concept and patterns. The design comes with the built-in lighting that can illuminate the kitchen background. 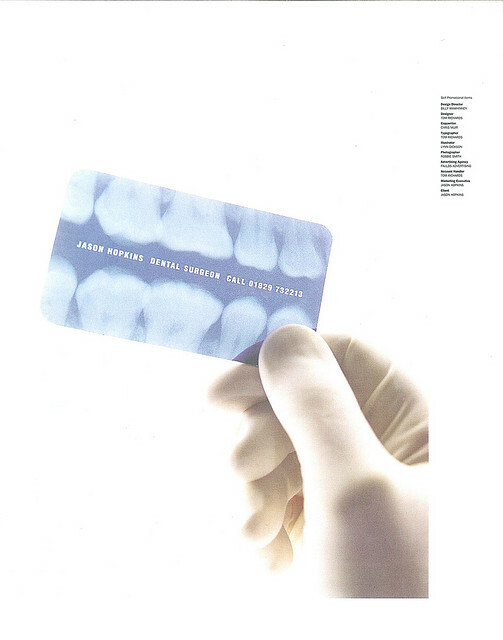 There is nothing more authentic than teeth on a dentist’s business card which is printed on X-ray film. Trust me, this creative business card doesn’t make dentists any less scary. This spine tattoo is not only a nice example of novel tattoos, but also a incredible piece of art. The proportions are just right. A girl with this tattoo on the back will absolutely wow her partner when she takes her top off, in case the fact that she takes off her shirt itself is not impressive enough. UV tattoo is the kind of tattoo that uses UV ink to make the tattoo visible only in the dark, thus spares you from the risk of letting your tattoo be seen during day time. 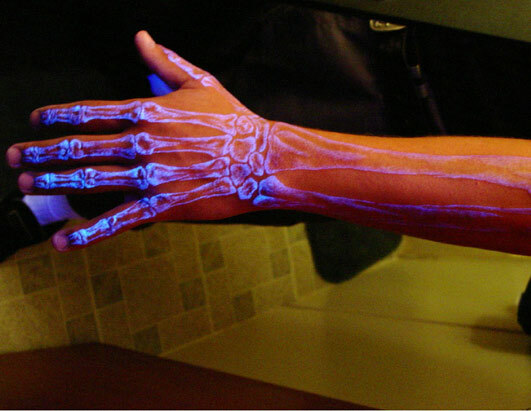 An X-Ray UV tattoo will make you incredibly cool in a club or bar, yet still reserve your up-right employee image at work. If you think that the two tattoos above are creepy, think again. 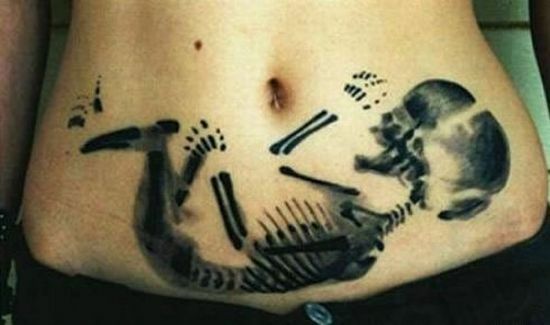 This tattoo shows a soon-to-be-born fetus on a girl’s lower tummy to details. Even though the tattoo is a highly recommendable piece of art in its own right, it’s a myth who would want this kind of tattoo. Casttoos, in case you are not familiar with the term, are decals that are applied with heat to your cast like tattoos. 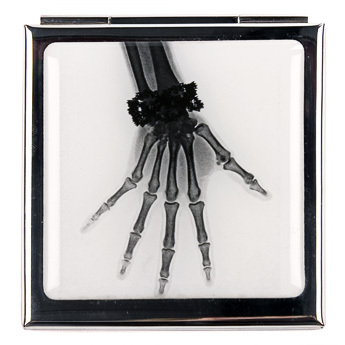 These X-ray Casttoos feature various radiographic designs. You can even send your own busted-up X-ray to create a custom Casttoo to show off your injury. To celebrate MTV’s Spring schedule in 2008, the network joined forces with Sky to launch its very own MTV Multiroom box design. 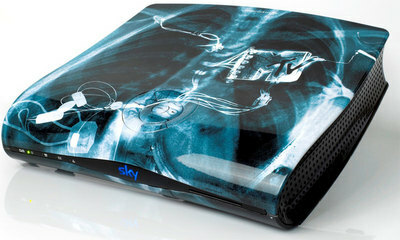 Essentially, it’s the same as any other Sky Multiroom box, but it has been pimped out the custom human X-ray design, which even spills over on to the remote. Extremely limited and highly collectible. How cool is that to have a see-through handbag to expose your eccentric personality while keeping the privacy of your belongings at the same time? 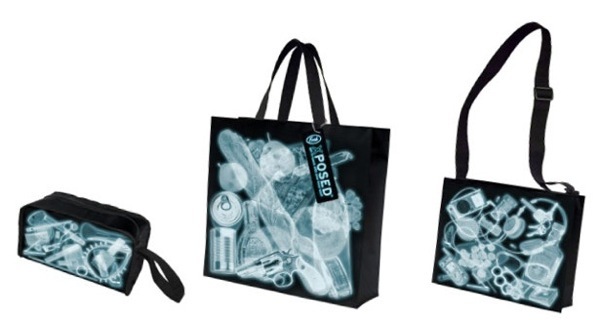 Each of these Xposed X-ray bag is made of durable, non woven plastic fiber and features a funny x-ray style design that matches it’s intended use. With the prices ranging from $9.95 to $19.95, those X-ray bags will make cool affordable gifts for your girl friends. Hand mirror is now truly a hand mirror when it consists of a mirror and a hand image. Ladies, bring this hand mirror on your first date and you will risk a chance of either scoring a brownie point or giving your date an unnecessarily correct perspective of how creepy you are. This is a design of Helmut Newton, sold at $50 each. Here comes an excuse to go back to those old fashioned knee high socks. 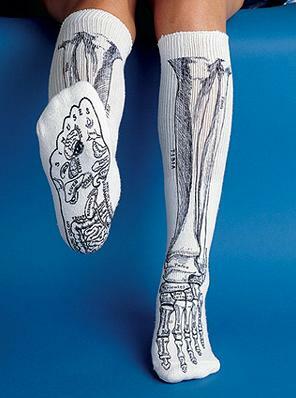 Those Anatomically Correct Bone Socks, kind of wearable X-ray, will not only make you look less of a nerd but also freak your classmates out in the school gym. The X-ray game gets much more interesting when the big names join in. Adidas has launched a Jeremy Scott track suit design that looks similar to a wearable skeleton. Decorated with a full-body x-ray print, the X-ray suit is one of the most eye-catching Jeremy Scott releases so far. The suit comes with a jacket and a track pant. Nike and Adidas are ultimate rivals, and the battle they fight has now reached the X-ray climax. 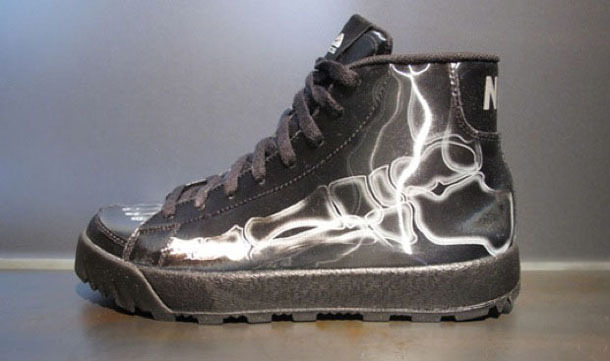 If Adidas has Jeremy Scott X-ray track suit, Nike has Blazer ACG Premium X-ray. This pair of shoes features a rugged ACG sole that can stand the test of time, but its best feature is the X-ray foot on the side of this predominantly black shoe. This is a T-shirt that will wow your friends and scare the kids 1000 miles away. 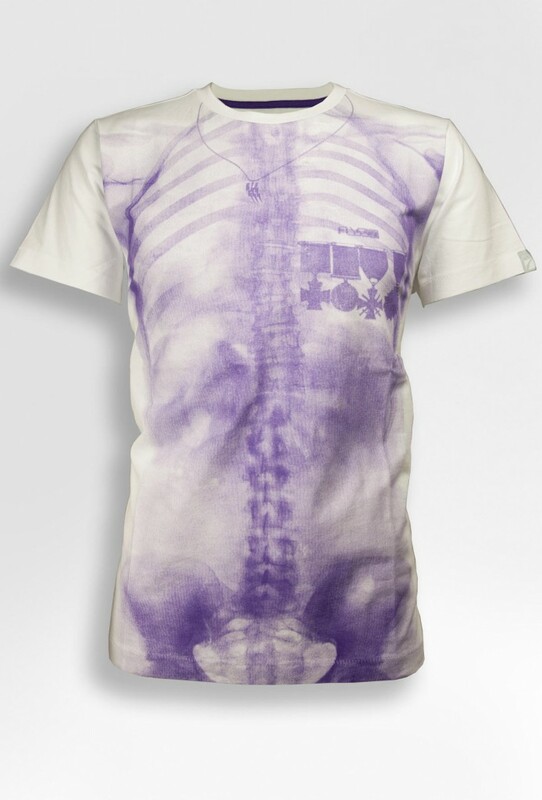 With photographic x-ray printed across front, the T-shirt will make you look like a walking skeleton. To make it even more threatening, the tee also has Fly53 and military medal print on chest. 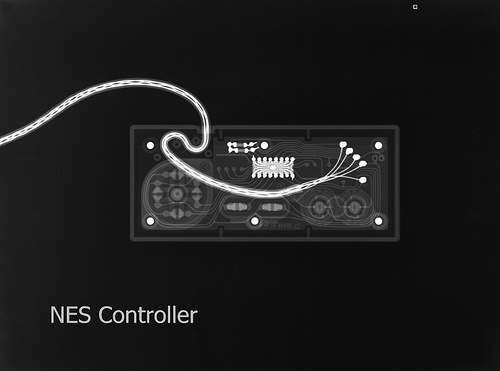 For those who have always dreamed to see how your favorite gadget was assembled, X-ray images of them will give you absolute satisfaction. 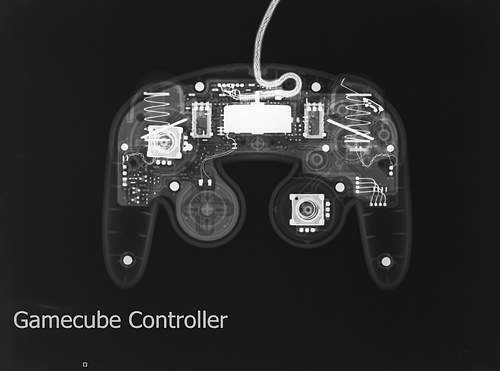 Rainje’s gallery features many radiographs of video game consoles and controllers, including NES, Wii, Xbox Controllers and so much more. The Simpsons have been around since forever, and the quirky Homer has captured the heart of millions of viewers around the world. 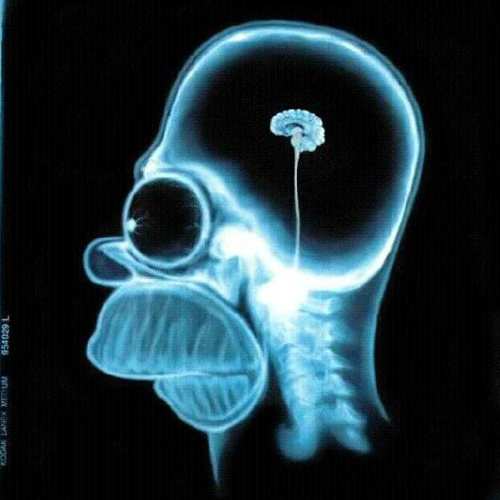 If getting a piece of him on the screen doesn’t satisfy your appetite, let’s have him anatomized under radiography. He sure has a very small brain. Kermit the Frog may not be the cutest friend during your childhood, but it will probably bring a smile on your face whenever you think of it. 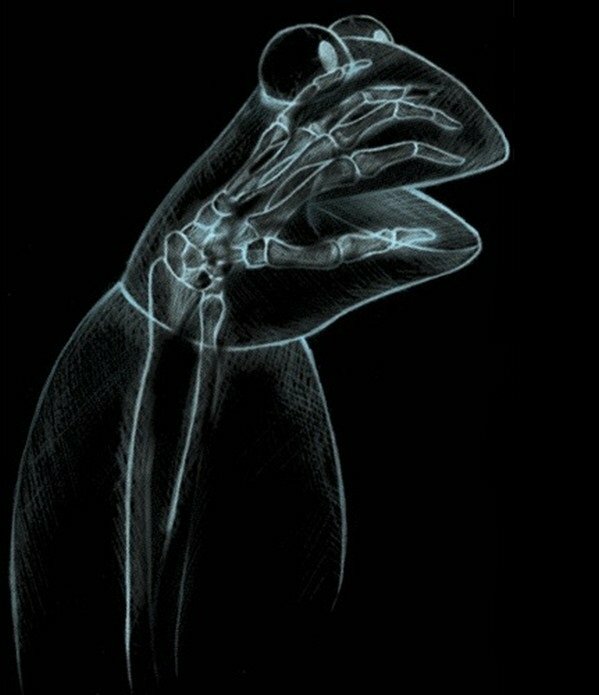 This cool image is the official release of a Kermit the Frog X-ray created by Joshua Kemble titled: Puppet Check Up.